Dr Mun is an accredited Incognito™ Hidden Braces provider. With Incognito™, you can enjoy orthodontic appliances that are on the inside (tongue side) of your teeth, making them 100% invisible, because you can’t see them from the outside. Experience the confidence that comes with having straight, beautiful teeth! Incognito™ Hidden Braces are suitable for anyone who wants to have straighter teeth — especially adults with more complicated cases. With these appliances, Dr Mun can achieve difficult movements that might be more challenging to manage with other types of braces. If you’re not a candidate for Invisalign®, but still want something “invisible”, then Incognito™ is an excellent option. 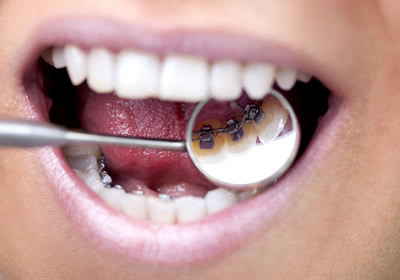 With this option, you don’t have to remember to put the braces in and take them out. Many of our patients enjoy the fact that they do not need to be removed while out on a lunch date with their friends. With Incognito™ Hidden Braces, some of our patients experience a slight impact on their speech and eating habits. Fortunately, with some practice, these concerns can be managed. To find out whether or not Incognito™ orthodontics is an option for you, contact MV Ortho to schedule a consultation with Dr Mun in our Mona Vale office. We’ll be happy to discuss your treatment choices, so that you can select one that’s both aesthetically and functionally effective for your bite.